City in the government of Vitebsk, Russia. It is situated on the River Düna, at the intersection of two railroads. It was founded in 1278 by the Knights of the Livonian Order, and in 1561 was annexed to Poland. 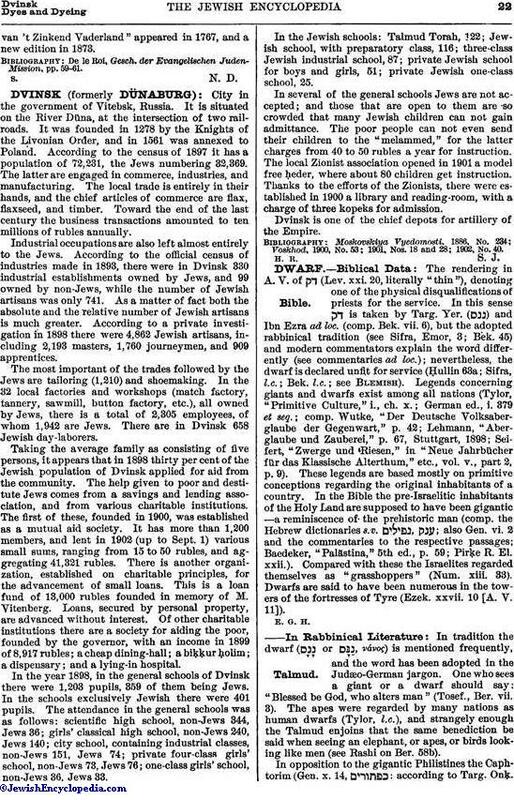 According to the census of 1897 it has a population of 72,231, the Jews numbering 32,369. The latter are engaged in commerce, industries, and manufacturing. The local trade is entirely in their hands, and the chief articles of commerce are flax, flaxseed, and timber. Toward the end of the last century the business transactions amounted to ten millions of rubles annually. Industrial occupations are also left almost entirely to the Jews. According to the official census of industries made in 1893, there were in Dvinsk 330 industrial establishments owned by Jews, and 99 owned by non-Jews, while the number of Jewish artisans was only 741. As a matter of fact both the absolute and the relative number of Jewish artisans is much greater. According to a private investigation in 1898 there were 4,862 Jewish artisans, including 2,193 masters, 1,760 journeymen, and 909 apprentices. The most important of the trades followed by the Jews are tailoring (1,210) and shoemaking. In the 32 local factories and workshops (match factory, tannery, sawmill, button factory, etc. ), all owned by Jews, there is a total of 2,305 employees, of whom 1,942 are Jews. There are in Dvinsk 658 Jewish day-laborers. Taking the average family as consisting of five persons, it appears that in 1898 thirty per cent of the Jewish population of Dvinsk applied for aid from the community. The help given to poor and destitute Jews comes from a savings and lending association, and from various charitable institutions. The first of these, founded in 1900, was established as a mutual aid society. It has more than 1,200 members, and lent in 1902 (up to Sept. 1) various small sums, ranging from 15 to 50 rubles, and aggregating 41,321 rubles. There is another organization, established on charitable principles, for the advancement of small loans. This is a loan fund of 13,000 rubles founded in memory of M. Vitenberg. Loans, secured by personal property, are advanced without interest. Of other charitable institutions there are a society for aiding the poor, founded by the governor, with an income in 1899 of 8,917 rubles; a cheap dining-hall; a biḳḳur ḥolim; a dispensary; and a lying-in hospital. In the year 1898, in the general schools of Dvinsk there were 1,203 pupils, 359 of them being Jews. In the schools exclusively Jewish there were 401 pupils. The attendance in the general schools was as follows: scientific high school, non-Jews 344, Jews 36; girls' classical high school, non-Jews 240, Jews 140; city school, containing industrial classes, non-Jews 151, Jews 74; private four-class girls' school, non-Jews 73, Jews 76; one-class girls' school, non-Jews 36, Jews 33. In the Jewish schools: Talmud Torah, 122; Jewish school, with preparatory class, 116; three-class Jewish industrial school, 87; private Jewish school for boys and girls, 51; private Jewish one-class school, 25. In several of the general schools Jews are not accepted; and those that are open to them are so crowded that many Jewish children can not gain admittance. The poor people can not even send their children to the "melammed," for the latter charges from 40 to 50 rubles a year for instruction. The local Zionist association opened in 1901 a model free ḥeder, where about 80 children get instruction. Thanks to the efforts of the Zionists, there were established in 1900 a library and reading-room, with a charge of three kopeks for admission. Dvinsk is one of the chief depots for artillery of the Empire. Voskhod, 1900, No. 53; 1901, Nos. 18 and 28; 1902, No. 40.